If you want to succeed online, then you have to establish yourself on the internet. You have to make new contacts, build up communication and trust and authority online. It’s easy to sign up and join any of the online social platforms but having such an authority in any network is worth spending the time. The good side is that you can use your authority for your online venture to make profit. You have to determine what you are building. Are you building your personal brand or your blog’s/ company’s brand? These days lots of people have created social profiles to promote their blog and used the name to build buzz for their brand. If you want to build up a long term brand and a brand which you can use forever, then I would suggest you to build your self as the brand. If you work to build your personal brand, then you will have long term benefits. First of all you are the owner and you can use it to promote any of your projects you want. But if you use your blog as the brand and few years later you move on to a new project, then you have to start all over again. If you choose to use your blog as a brand, then use your blog’s name and the logo. If you choose to build your personal brand then use your original name and picture. I used my real name, Tamal Anwar and the real picture as my profile image. Create a word document in your desktop and write a short 150 words paragraph about you to introduce yourself. You have to write about yourself in every social profile you create, so copy-paste the same text to save time. Choose a nice profile picture(use real picture) and make 3 copies of it. Create one small (48×48 pixel), one medium(125×125 pixel) and one big image (free size). Use a square image so it won’t look messy if resized. Create a social profile from Facebook or Myspace. I choose these two because these are popular and have lots of active users. Create a profile in one of these or use both of them if you wish. Once you are done, make some friends and join some group. Browse the network regularly. Create a professional profile from LinkedIn. There are lots of professionals on the network. This will help you to create new professional contacts in your business. LinkedIn profile is a great way to share about your profession, expertise and lots of things. You can connect with people from different industries and ask for recommendations. This will work just like your own online CV. You browse a lot of things online. Social bookmarking sites are great place to store your favorite links. I would suggest you to use Digg and StumbleUpon. Create a digg profile and use the network to Digg(vote) stories you like. You can also submit your own page from your blog and promote it. Digg is a great site to get traffic. Sign up for StumbleUpon and download the toolbar. Browse pages and Thumb Up! the pages you like. You can use Stumble to get tons of traffic to your blog also. YouTube is the no 1 place for video sharing. Use the community to browse videos and you can also use it to promote your blog. You can create viral videos and see how it brings new visitors to your blog. Blog Catalog and My blog log are the two great communities to promote your blog. Create profiles in those platforms and add the recent visitors widget in your blog. My blog log has a unique service to manage your blog readers. Blog Catalog has a great bloggers base and you can use their forum to promote your blog. Be active on those communities to build your own brand. Micro blogging sites like Twitter and Plurk are great places to share what you are doing right now. They are not time wasters, they have a great role in communication and micro blogs can bring traffic to your blog. You can use the service with your mobile phone and keep your followers updated. Gravatar is a service which will help you to keep your identity using your own picture. Gravatar adds your picture on your email address and when you will leave a comment on a blog post, your profile image will show up on the comment. This will help you to spread your picture every where you leave a comment building a known face. Other social tools, plugins and networks you can use to keep up with your social profile. Sign up for a FriendFeed account which will allow you to conncet with all of your social profiles. Other people can connect with your updates in friendfeed too. You can use Ping.fm to update all of your social pages, blogs and status from one place. Use entrecard to get traffic and drop entrecards on different blogs you visit. This way bloggers will know about you and your blog. Cross link and promote all of your social profiles together and see how your brand goes up. Add all of your social links on your blog and other profiles. Micro blog about an article and ask for diggs or stumbles. Vote for a content on every social network you use. Connect with a person on his every social profile you use. If you want to build a personal brand, want some connections and want to bring something out from the networks, you have to be active on the networks. Complete your profile and stay on those sites. If you don’t like a community, remove it from your list and focus on the community you like. Join groups and be active on the discussion. Keep your discussions relavent, don’t just have a mentality to bring everyone to your website. If you can build trust and authority, your friends will sure come to your site. 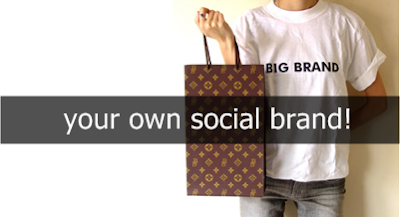 How you are building your social brand? Do you have some active profiles or you just want to be on every social platform? How you communicate with people and is it working for you? tell me.